The first time I ever made tomato sauce, I bottled the skins and discarded the sauce. The recipe said to boil for three hours then strain. I looked at the stuff in the strainer. It was thick like homemade sauce. I looked at the stuff that came through the strainer. It was runny, flavoursome probably, but runny. I tried ringing Mum to ask which was the sauce, but she wasn’t home. I decided it wasn’t a bad thing to have missed out on asking such an obviously dumb question –if the recipe doesn’t even need to specify which one to keep, then everyone in the whole world must know. Except me. So, I popped a bit of the runny stuff into a container in the freezer as it seemed wasteful to discard it all, and into my sterilized jars went all of the skin and pips. I felt a bit the same walking out of Spotlight last week empty-handed because I didn’t know how many little boxes I needed to make our first-ever Advent calendar. In hindsight, a bit more thought on both occasions may have allowed me to come up with the correct solution. Another thing I’ve learnt is that an Advent calendar was used to count or celebrate the days of Advent in anticipation of Christmas. And I had to look up Wikipedia to find out that Advent (from the Latin word adventus meaning “coming”) is a season observed in many Western Christian churches, a time of expectant waiting and preparation for the celebration of the Nativity of Jesus at Christmas. Cadbury didn’t invent Advent calendars as a way to sell 24 Freddo frogs in the lead up to Christmas. I knew that part, I’m not that dumb. Elsie and I had a lot of fun making it. She stuck the sticker numbers on. Then we ran out of stickers and she ran out of interest and wandered off and I was left cutting and pasting and wishing Advent started more towards the middle of the month. The funny part is, she loves it so much on the wall as it is. We’ve both forgotten that each day we’re supposed to be running over to it and opening another little box to find an activity or a treat. Which is lucky because all of the boxes remain empty. With Nanna’s help, she’s written a letter to Santa and asked for a yellow hippopotamus. Ah, good luck with that Santa. Perhaps I’ll need to explain that Santa only had red left (if indeed he can make or find a red hippo in time). That would be better than saying he thought you were naughty to eat the entire bottle of kid’s multivitamins off the window sill while your mother was in the shower. Because I was really the naughty one to leave the multivitamins there on the window sill next to Anthony’s antibiotics and the Antrid. The window sill is now clear. Except for a tiny screw out of something (I don’t know what, but would hate to find out the day after I’ve thrown that little screw out) and part of the pepper grinder that doesn’t need to be glued back on anymore because I’ve since dropped the whole thing and broken it (Santa? Listening?). You are such a scream! Zara asked Santa for a fishing boat…………. P.S Love the picture on the wall! I love your advent calendar. It is gorgeous. 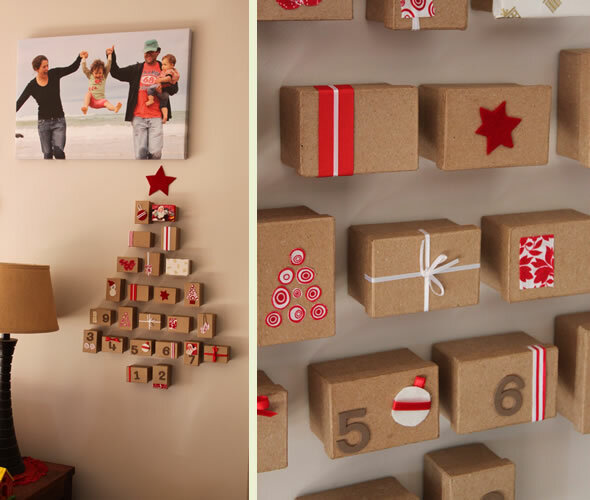 GREAT advent calendar, Larissa (and very funny post)! Don’t suppose you feel like shipping one to Railway St?